The vegetation index is often calculated in order to better define the vitality and photosynthetical activity of plants. The characteristic elevation of the reflections curve of vegetation from visible light to infrared (NIR) is now more relevant. The low vegetation reflectance in the red region is followed by a sharp increase to high reflectance in the near-infrared. 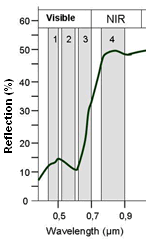 This steep increase in reflectance is known as the red edge (see figure). The larger the quotient, the larger the percentage of healthy vegetation. The NDVI is related to many properties of plants. It is used to identify the health status of plants, to depict phenological changes, to estimate green biomass and crop yield and other applications. For more information switch to the module Remote Sensing and Geo-Information in Agriculture.